Three DJs were in a spin today after celebrating 35 years with a hospital radio station. Peter Foster, Andy Venton and Andy Worth all answered the call when a once-a-week station was being started for the patients of Dorset County Hospital in September 1966.The forerunner of Ridgeway Radio was started in the tiny attic of what is now the Dorchester Conservative Club in South Walks. The first programme was introduced by the then mayor and Lord Lieutenant of Dorset, Colonel Weld, and featured an hour of music a week, piped through to the hospital, which was then in Princes Street, via a landline. The service now operates 24 hours a day and has won national awards for its professionalism. 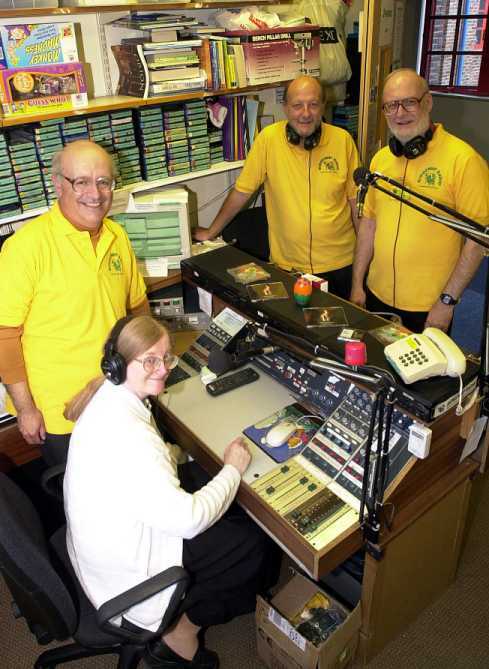 Over the years the team has conducted interviews with local people and organised numerous outside broadcasts, including all the Weymouth and Dorchester carnivals since the early 1970s. The Fosters started up a slot where they go to London to interview special guests, which have included the former Archbishop of Canterbury Geoffery Fisher, who performed the coronation of the Queen, John Snagge, the BBC commentator who covered the coronation, and Godfrey Talbot, the BBC’s first court correspondent. The couple also go up and cover the Lord Mayor’s Show for the benefit of the hospital’s patients each year.